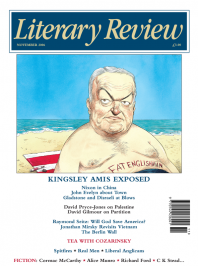 Kingsley Amis was a prominent figure in English letters from the mid 1950s on, but whether this was because his clubbable personality automatically attracted publicity or because there was enduring worth in his books is more difficult to answer; hence my use of ‘prominent’ rather than ‘significant’. Zachary Leader is in no doubt that Amis was a major literary figure and makes extraordinary and, I submit, exaggerated claims for his importance. Let me attempt a judicious summing-up. Amis was a good minor poet in the Robert Graves tradition (Graves was one of his heroes), a writer who insisted on precise craftsmanship and lucid meanings in verse; he had no time for the elaborate symbolic apparatuses of W B Yeats, T S Eliot, Wallace Stevens et al – authors whose work often does require a concordance before one can understand it. He was a good minor comic novelist, not in the class of Evelyn Waugh or P G Wodehouse or even, for my money, Peter de Vries; but there is no denying that Amis could often be extremely funny. He was an essayist of high talent, though again not quite in the premier division with the likes of Gore Vidal. And by all accounts he was a brilliant mimic, a superb raconteur and a sparkling conversationalist. Not a bad man, then, to have as a dinner-table companion. But is he important enough to warrant a 900-page biography? Certainly not.